But first lets get to the webisode. 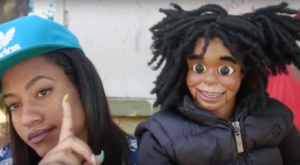 The new #spilltheTEA features rising hip-hop artists Ricky From Harlem and Chris the ventriloquist. Ricky speaks on not being labeled as a “dummy,” working with B.O.B. in Atlanta, and his rambunctious love life. The two have also composed a tribute to the deceased, Atlanta icon Shawty Lo by participating in the #DeyKnowChallenge. Tweet or tag Teacup in your #DeyKnowChallenge on Instagram & she will also share it on her social media accounts.